This is the first time the MotoGP championship has appeared on PSP, allowing fans to race against their biking heroes, including Italian legend Valentino Rossi and Spanish veteran Sete Gibernau, on some of the most exciting circuits in motor sport. Moto GP (or sometimes known as MotoGP) finally skids onto the PlayStation Portable that once again allows gamers to race in the dangerous world of motorbike racing. To make things even more interesting and some would say more realistic, the developers have also included some of the biking greats from around the world to continue the tradition of this highly popular motorbike series. 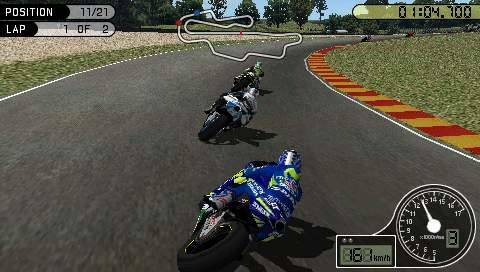 The gameplay of Moto GP, although it features your generic racer style of gameplay basically allows the player to compete in a variety of motorbike races from around the world in order to claim the prestigious trophies of racing. Whether you’re racing in a season or challenging your friends through wireless multiplayer racers with up to 8-players, this title is action packed with racing excitement. Although this title has been on a variety of different console platforms, the control system on the PSP is perfect which uses the analog stick in conjunction with the d-pad and the shoulder buttons to allow the player to accurately interact with the environment. With that said, the accuracy of the title is perfect and players will have little problems while racing at deadly speeds around insidious corners, slopes and hills. Graphically, Moto GP unfortunately feels a little dated on the PSP and it doesn’t feature the highly detailed environments of Need for Speed or Ridge Racer 2 but it is still an adept game. The features that really stand out in the title are the realistic modeling on the bikes with high resolution texture details that move with realism and grace. Generally speaking, the backgrounds in many of the Moto GP series are a little sparse and this current incarnation doesn’t really offer much more to the genre. However, for those that want a sense of speed, Moto GP really immerses you into the high speed world of motorbike racing that will have speed freaks coming back for more and more. The musical score of Moto GP nicely melds with the graphics engine and add in a wide gamut of sound effects from the drones of these powerful bikes, to the sounds of your rider sliding off his bike and one could be forgiven in thinking that they are watching this on TV. In conclusion, Moto GP is a rather enjoyable title on the PSP that features great playability, sturdy graphics and a variety of different gameplay modes that will ensure those gamers who love racing to come back time and time again. Great stuff!